boxing AND circuit TRAINING FITNESS CLASSES - personal training - WELLINGTON CBD. 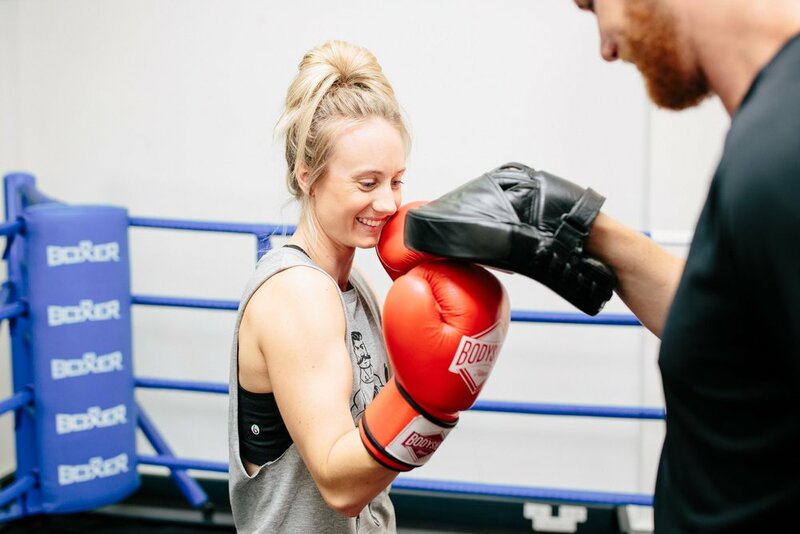 Whatever wellness goal you are fighting for, the team at Body Shot is in your corner. It is our mission to help our people “win their fight” by making fitness as much fun as possible. Body Shot Fitness is a great option for those that find the usual gym experience boring or hard to stick to, or for those who want to add some fun and intense variation to their routine. We provide expert boxing, kicking and fight conditioning (circuit training) fitness classes, with personal training options available. Consistency is the key factor in winning any health and fitness fight. Give us a try, we’re your best shot. Enjoy the journey, win the fight! Our team are qualified, experienced and professional. But most importantly, they know how to make your fitness experience enjoyable. These people make Body Shot what is is and we're proud to call them family. Whatever wellness goals you are fighting for, they are passionate about helping you win and making the journey fun. Unlimited access to all our timetabled classes as often as you like. Attend a maximum of two scheduled classes in one calendar week. Attend a maximum of one scheduled class in one calendar week. * Unused weekly sessions cannot be carried over to the following week or used in the future. *Payments are monthly in advance on the 1st of each month (collected via ezidebit). Ezidebit adds a one off $5.50 set up fee and a $1 per month transaction fee(subject to change). Monthly fees are calculated like so: Weekly fee x 52 (weeks of year) divided by 12 Months. *No long term contracts. Give notice of cancelation to info@bodyshotfitness.co.nz and pay 1 further scheduled monthly payment. *Minimum of two weeks notice required for suspensions and no partial months allowed. Attend any 10 classes within a three month period. Payment by eftpos at reception or by online banking. Casual classes (based on availability). Pay on the day by eftpos at reception. Email us at info@bodyshotfitness.co.nz if any issues. Get 1 on 1 attention from one of our experienced boxing, martial arts and fitness trainers. Have your round alone or have up to 2 people join the session for no extra cost (This does not apply to Unlimited Member discounts discounts or specific packages, T&Cs apply). This is a great opportunity to experience the benefits of having a private trainer before committing to more sessions. We offer personal 1 on 1 training in a private space. Monday - Saturday: See class timetable. It's my first class, what do I need? First, make sure you have registered for a free trial and let us know of any medical concerns before coming in. Arrive at least 10 minutes before class is due to start. Glove hire free for your first shot then $2 per class. We sell gloves and wraps with member discounts. Bring a drink bottle and sweat towel. Do I need to be fit to join in? Although our classes are high intensity and high impact, they are for all fitness and skill levels. Our instructors will give you options to make the exercises easier or harder. As your technique improves, so will your ability to push yourself. If you have any medical conditions that may affect your ability to exercise, we ask that you consult with your medical professional before participating in any of our services. Do I have to have previous experience with boxing? Our classes are designed to cater to all fitness and skill levels, and we mean that! From the absolute novice who has never put boxing gloves on, to the experienced boxer, you are all welcome and will all get benefit from our workouts. If you're new to boxing fitness we recommend trying 1 on 1 Boxing Basics session to get your confidence up before joining in a full class. We also have a variety of classes that don't involve any boxing at all. So if punching isn't your thing, we have plenty more to keep you going. Do you have changing rooms and showers? We have access to male and female changing rooms and showers on the ground floor (down 4 flights of stairs). We do have male and female toilets on our floor. We recommend turning up changed and ready to go. You can store your bags in our cubicles on the gym floor. Can I store my gear on site? We are just a small space and ask that you take home your personal belongings after every session. Can I use the gym outside of class hours? Our gym is class based, so unless you are at a class, or have a personal training appointment, the gym will not be available for further use.